We have the Niagara River and Chippawa Creek in our backyard so this course is perfect! Learn about the different types of drift diving environments and how to safely dive them. Drift Diving is fun, easy on some dives and can be challenging on more advanced drifts. This course offers you a sampling of different drift diving environments and will give you experience to drift dive most places after certification. Upon Request. Contact the shop to find out when we are running one of our Drift Diver Courses. 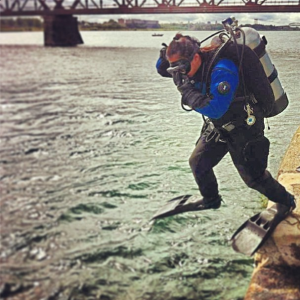 In the Niagara region, we do a lot of drift diving in the Upper & Lower Niagara River and Chippawa Creek, so you’re in luck because we drift dive at least weekly in these locations and have extensive experience and knowledge of these sites. This course is available to divers who want to experience a range of different types of drifts under the direct supervision of your PADI Instructor and get the recognition for it in a formalized course. Want to know more about PADI Drift Diver?